Cau Vang or the “Golden Bridge”, as it’s more commonly known, has become one of Vietnam’s top tourist attractions in recent months. It opened in June and quickly made Time’s 2018 list of the World’s 100 Greatest Places. After seeing Golden Bridge for myself, it was easy to understand why. Golden Bridge is often described as a walkway in the sky. It sits high up, in the mountains, at roughly 1000 meters above sea level. The bridge is a shimmering golden walkway that is supported by two giant hands. The hands, meant to symbolize those of God, have an intentional weathered look and appear to be antique. They are said to be lifting the bridge toward the heavens. The stretch of walkway is about 150m and offers breathtaking views of the forest below. 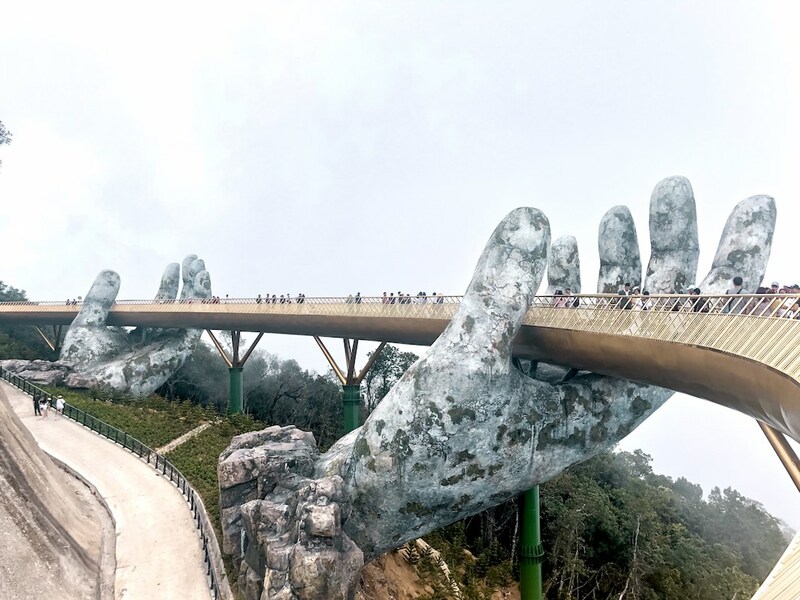 Golden Bridge is located in Ba Na Hills in central Vietnam. It is about a forty-five minute drive from the city of Da Nang. It is actually located in one of Vietnam’s most popular amusement parks, Sun World Ba Na Hills. Some of the attractions include a French village, wax museum, and flower gardens. Golden Bridge connects two of Sun World’s cable cars. The cable cars hold multiple Guinness World records. Two of them being the longest (5,801 m) non-stop single track cable car and the highest (1,368 m) non-stop single track cable car. The only way to access the bridge is via cable car. I would not recommend visiting Golden Bridge if you have a fear of heights. After finding out Golden Bridge was part of an amusement park, I was somewhat disappointed. It wasn’t exactly what I had in mind when planning my visit to Vietnam. However, you are not required to go into the actual area containing the rides and games to view the bridge. I chose to take the cable car to the bridge, spend some time there and then return to the bottom. If you want to spend the day at the park, you can continue onward in a second cable car. The closest airport to Golden Bridge is Da Nang International Airport. From the city of Da Nang, you will then need to find transportation to Ba Na Hills. You will have the option of hiring a private car, taxi or finding a group tour. I chose to hire a taxi and was lucky enough to find a great driver as I was leaving the airport. I pre-arranged pickup for the following morning and negotiated a price. The cost for round trip, from/to Da Nang city, including two hours of wait time, was 700,000 dong ($30 USD). A taxi or private driver can drop you off directly in front of the ticket booth. From there, it is a short walk to the cable cars. Look for signs directing you to the Ga Hoi An car. There are multiple cars and it can be somewhat confusing, so don’t be afraid to ask. It will take about twenty minutes to reach Golden Bridge from the bottom of the mountain. Golden Bridge has become an extremely popular attraction. You can expect somewhat fewer crowds in the the humid and often rainy months of the off-season. These are the months of May through October. I would also recommend arriving as early as possible to avoid the large crowds. The first cable car starts running at 7 am. I arrived slightly before this and found the ticket office to already be open. I had about an hour on the bridge before it quickly became flooded with visitors. Early morning is also a great time to visit because you can watch the morning mist roll away from the hills. It was incredibly beautiful and peaceful. In order to visit Golden Bridge, an admission ticket to Sun World must be purchased. The price of the ticket is 700,000 dong ($30 USD). The cable cars, rides and arcade games are all included in the price. I didn’t actually enter the amusement park, but the cable car ride and the bridge itself was worth the ticket price to me. The views from the cable car are amazing! It’s not difficult to see why Golden Bridge has quickly made it to the top of everyone’s bucket list. If you need simple and affordable accommodation in Da Nang, I suggest Grandvrio City Danang. It’s fairly inexpensive, clean and has an extremely friendly and welcoming staff. Looking for more amazing places in Vietnam to photograph? Check out my post, Vietnam’s Most Instagrammable Spots, on We Are Travel Girls! I keep seeing amazing photos of this bridge and I’d love to go check it out! Such an awesome artist must’ve created this! Yea!It was pretty incredible. I definitely recommend checking it out. Definitely put it on the bucket list. It was incredible! I’ve been seeing pictures of this bridge but had no idea how to get to it. Thanks for the tips.Vietnam is on my list this year and I’ll definitely be headed here! Vietnam has been one of my favorite countries to date. Definitely go if you get the chance!